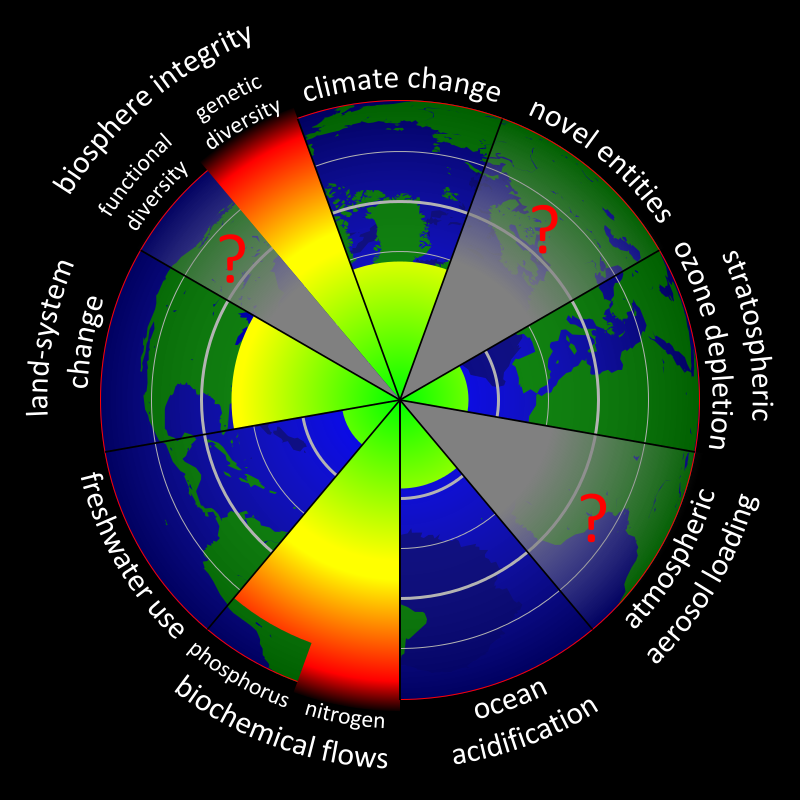 I recently attended a talk at the University of Surrey by the formidable Johann Rockstrom on the concept of Planetary Boundaries (PB). These are a set of nine distinct environmental categories within which humans are creating a pressure that is threatening to push the Earth’s climate out of the relatively stable period we have enjoyed for the last 10,000 years. They are in effect a definition of our environmental safe operating space. The talk featured the word resilience frequently: the ability of Earth systems to resist the perturbations which we are inflicting upon them. Rockstrom had a lot of territory to cover within 50 minutes, but one thing which struck me about the talk was the focus on one PB: climate change. I found this interesting for two reasons. Firstly, the climate change boundary is one which we have yet to breach, but is one in which we know that we are pushing our luck. This was interesting as there are two PBs which we are already outside the safe operating space: biodiversity and biochemical flows (namely phosphorus and nitrogen). Even if we solve the climate change issue by decarbonising our energy systems, the issue of fertiliser use in agriculture will still be overstressing the biochemical flows boundary. Give the changing diet of the world to something more meat based, this boundary is showing no signs of getting the attention it deserves; something especially pertinent given the dwindling supply of mineral phosphorus. Secondly, PBs cannot be thought of in isolation from each other. My research is in the water, energy, food (WEF) nexus. It is a concept based upon the realisation that water, energy and food sectors are regulated in silos, but are in fact heavily intertwined: regulation bought in to govern one will almost certainly have an impact upon the others. Unless we are careful, that impact will be unexpected and negative. The research in the WEF nexus space is focused on understanding the interlinkages and breaking down those silo walls. Stepping Up: Sustainability for water, energy and food. Rockstrom’s choice to focus on one PB, to me, was very telling. It spoke of a global attention to environmental issues, but with a silod approach. This is not feasible if we wish to minimise our impact across all PBs. After all, climate change will create extra pressures in other PBs, such as ocean acidification. Yet, to tackle all of the PBs simultaneously is also not feasible. The WEF nexus concept is founded upon the base provisions that humans need to survive. We are the unifying lens through which elements of the WEF nexus are pulled together. Yet, I do not get the sense that the PBs has an equivalent binding centre. Indeed, humans are specifically removed from the PB setting. Therefore, to avoid a slew of potential unintended consequences of addressing PB issues individually, there needs to be a unifying factor to help bind them together: without the presence of humans this must be something else. The repeated reference to resilience implies energy. To me it is surprising that energy is not the tenth planetary boundary. This is separate to energy in the context of burning fossil fuels, or solar PV, but rather energy in the most basic sense: that the Earth has available to it a finite amount of energy provided by the sun. This is a fundamental planetary boundary that cannot be breached. The resilience of a system must be linked to the energy available to it to apply a restorative force. During the Holocene the Earth’s systems have been able to absorb the perturbative energy that humans have been pumping into it, but we are reaching the limits of what is acceptable. Now the danger is that we may tip the systems into a new, energised state which will be unstable and unsupportive of our civilisation. However, perhaps it is not energy which is the determining factor, but the rate at which it is made available. This is the problem with climate change: we could burn every ounce of fossil fuel on the planet if, and only if, we did so at a rate slow enough that ecosystems could absorb the emissions. If we can understand the rate of energy input that each planetary boundary can withstand, then we can understand how quickly we can push them. In order to do this we must understand the power that each planetary boundary is subject to under normal operating conditions. For example, the biochemical flows: nitrogen and phosphorus would be flowing within the environment naturally without humans present. What is the power input which governs the maximum flow that can be withstood? This is the balance of rate of creation of biologically available nitrogen and phosphorus, against the rate that systems can absorb that any excess. Then we can understand the power that equates to our rate of nutrient use and compare the two power levels: the natural limit and the human input. So this is my question: can we identify the power which the PBs can withstand? Then we may be able to attribute relative amounts of power to PBs that have WEF nexus-like interlinkages and avoid unpleasant unintended consequences arising between the boundaries. When we can identify the underlying drivers of change and recognise how that affects the interplay of the separate Planetary Boundaries, only then can we identify a true safe operating space for humanity.